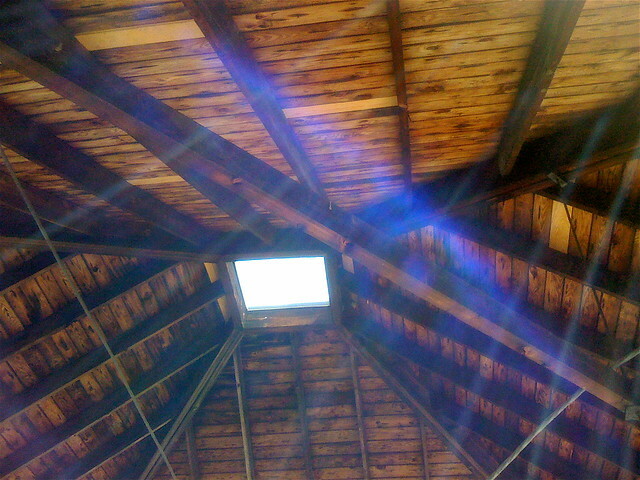 A skylight at Louis Kahn’s Trenton Bath House. Palin fails to understand the genius of our nation. The United States is one of the most vibrant religious countries on Earth precisely because of its religious freedom. When power and faith are entwined, faith loses. Power tends to obfuscate, corrupt and focus on temporal rather than eternal purposes. The whole essay is worth reading. As is Jeanne Devon’s ongoing explication of Sarah Palin’s new “book.” And (my hero!) Aaron Sorkin’s evisceration of Palin’s “reality” show. The photos above and below are from a bus trip I took last summer to see Louis Kahn’s famous Trenton Bath House, once the gateway to the Jewish Community Center’s swimming pool. Newly restored, it will resume service as a bath house — the pool is now owned by Mercer County — and architectural pilgrimage site. I chose the photo above because, while my relationship with religion and belief is strained…Actually, beyond strained. There are moments when I at least grasp the concept of God. 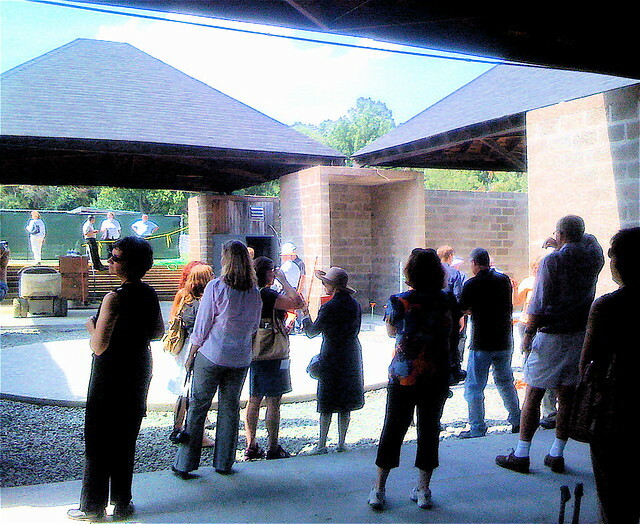 And they always involve a simple building, like Kahn’s Bath House, designed by an architect who understands the ethereal nature of sunlight. The photo above is my version of a homily. P.S. Another spot where I encountered that same weirdly inspiring interplay of sunlight, material, and space was the Swedish architect Sigurd Lewerentz’s St. Marks Church in suburban Stockholm. If you go to this website and scroll down to the photo at the bottom of the page, you’ll see what I mean. What is it, I wonder, about a simple square of daylight that moves me so? Worshiping Louis Kahn at the Trenton Bath House.